For sure around here, Andrew! With the blank cleaned up in the lathe, I bored it to fit the R8 shank. 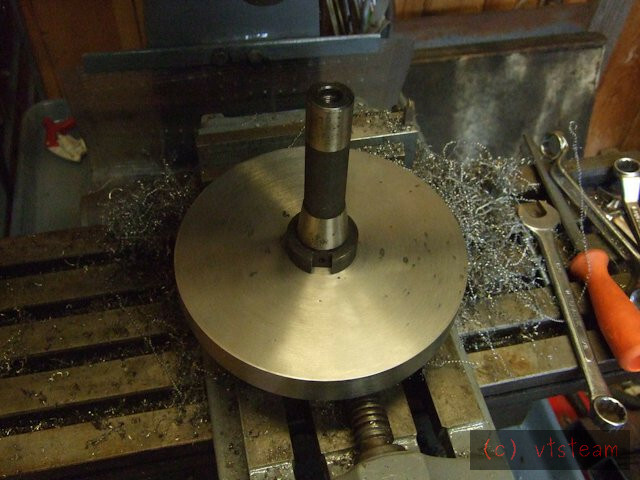 Unfortunately I found it was too thin (at 1") to fasten using the system on the older flycutter -- it needed a deep recess to countersink the head of the end fastener and there wouldn't be enough metal left so I went ahead and plug welded the R8 shank to the blank. 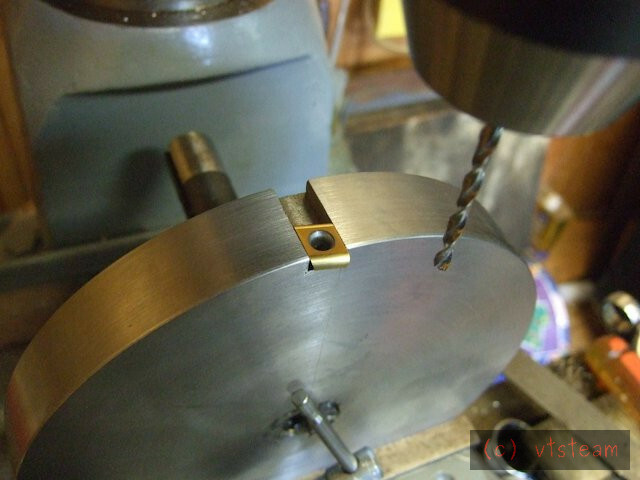 Then to make sure the flycutter was running true I mounted it in the mill, and mounted one of my lathe's quick change tool posts in my milling vise and trued the periphery, as if it were a lathe turned vertical. Your having a nice time! Looking forward to the results! 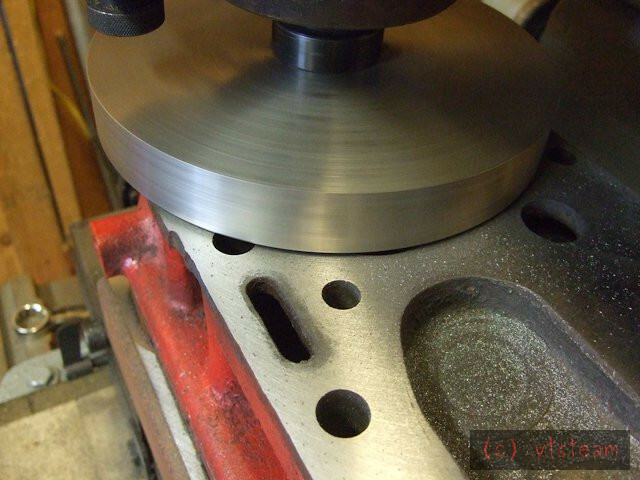 And this is where I left it this evening, ready to cut the tool slots. Looking good Steve,it doesn't look out of proportion to the taper shank and the inertia when running will help with the finish on the head skim. Look forward to seeing it in action.....OZ. 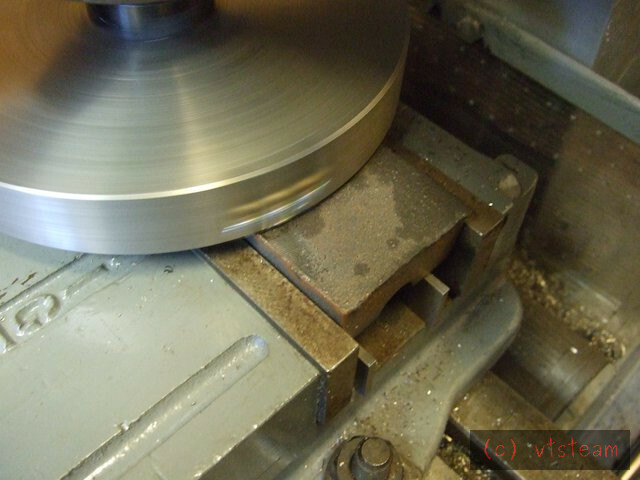 I found I could comfortably cut 5 thousandths at 120 RPM without much strain. Just a light "ting, ting ting..." Sounded like Christmas bells in the shop. You can see the hardened casting scale as the darker area surrounding the rough sand surface. The insert had no trouble cutting through both. Haha, no Andrew I wasn't! A lot more satisfying making a tool and using it. One more weapon in the arsenal! Once I had the back flattened, I flipped the casting over and took the skin off the front. Andrew what I did wish for, however, was a motorized mill slide! Man that was slow going to get that depth of casting scale off -- I probably did 20 passes total by hand standing there (too dumb or lazy to stop and go get a stool!) And at that slow RPM with a single cutter, I wasn't a ball of fire with the feed. Good to be sitting down and typing this now. You seem like a happy camper!! I guess tomorrow's the big day, with the tractor head. 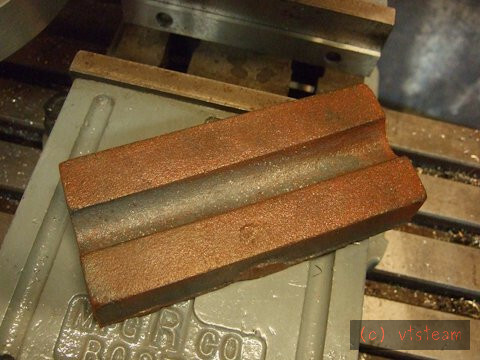 I ran the test casting back and forth to check whether it cut the same at the back and the front of the fly cutter. It didn't. So I figured tram was off. After a cut it would ting on the front and it was silent on the back. So I traversed the casting back with the motor running and lowered the head until I heard a ting at the back. The difference in height was 1-1/2 thousandths. Now the interesting part is that in the past with a conventional fly cutter, it hit at front and back. The reason it doesn't any more is because the new fly cutter is so stiff. The conventional fly cutter probably had a tiny amount of spring back, and also never quite cut to actual depth. This new one does. I figured to correct that small a tram error, I'd need less than 1 thou shim. On a hunch I just tightened the bolts on one side of the mill, just a crack. That did it and the tings were now equal on both sides. Nice job on the big fly cutter, Steve. Why not put 2 or 4 inserts on it? Hi Chuck, very hard to get those exactly the same depth without some kind of adjustment design. It could be done, but far more trouble for me than what it would be worth in cutting speed. I only have to take 12 thou off that head, and I was doing 5 thou a pass today, so it should be pretty quick to do the re-surfacing. The sand castings were different. 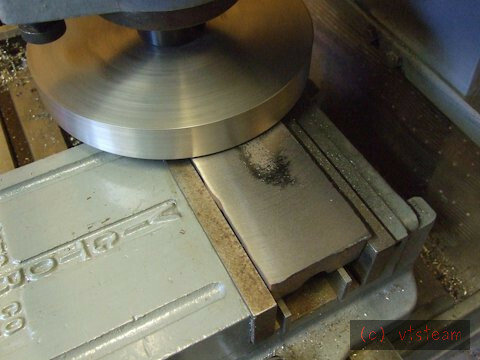 In future I'd probably first face those with a smaller home made end mill I have, also using an insert. I could dig deep with that, then finish up with the big one. 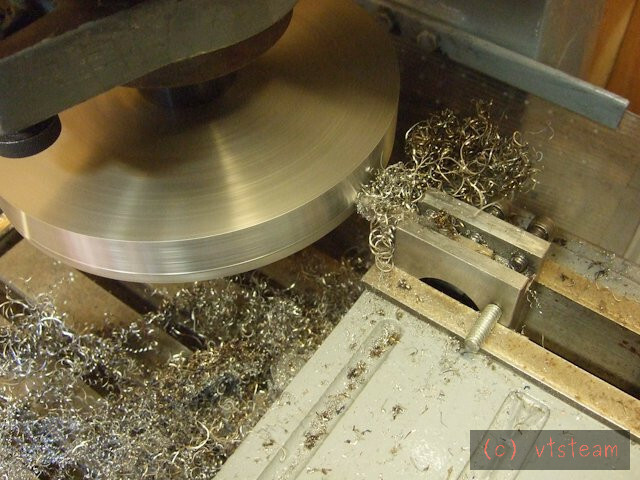 It's really a tool for doing finishing cuts -- and is pretty satisfactory for that, considering the price!! I think you're going to find lots of uses for your new fly cutter! Rig a temporary power feed using a battery drill. Simple two part adaptor. 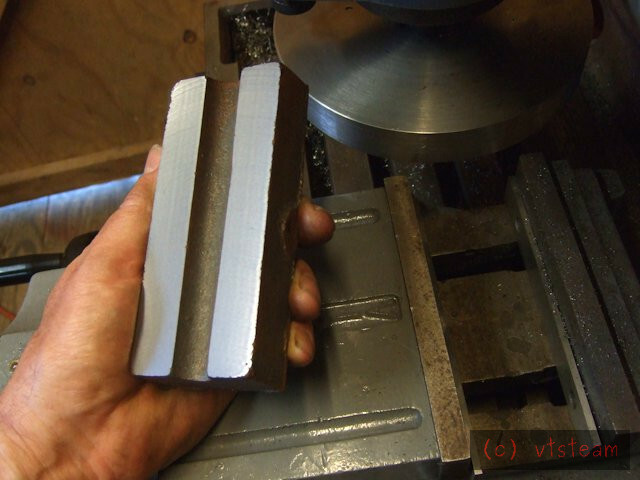 Bar in chuck with cross drilling and peg. Suitable female on feed shaft. 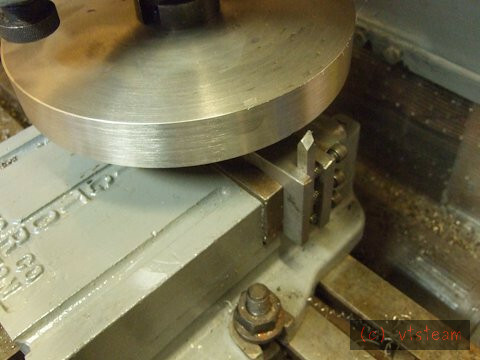 Did this on my lathe top slide for stubby taper turning. 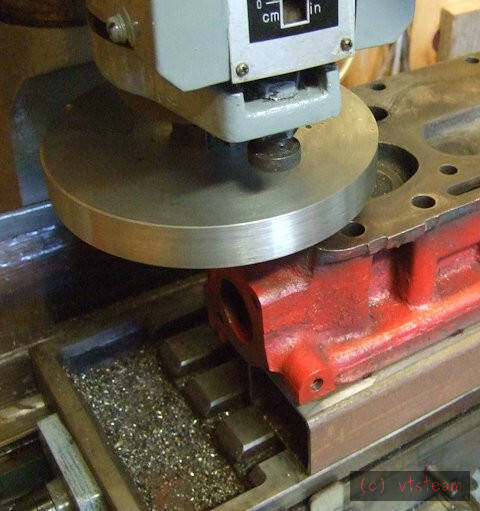 "Just in case" sort of idea/advice: Cylinder head may be difficult on mount on the mill table, specially if you need to move it middle of the setup (lucily you can do it on one go here). 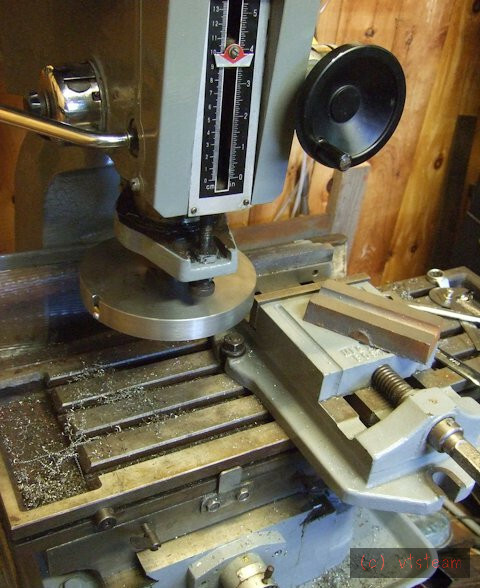 Therefore I have turned and tapped some buttons that will clear the head cluttery and will provide a repeatable/level mounting surface after the buttons are milled level with clinder gasket plane, pretty much the same way you did that casting few post back. I have used it on few adapters and one cylinder head. The cylinder head needed three buttons and two bars, but then it was really simple to level and clamp it. 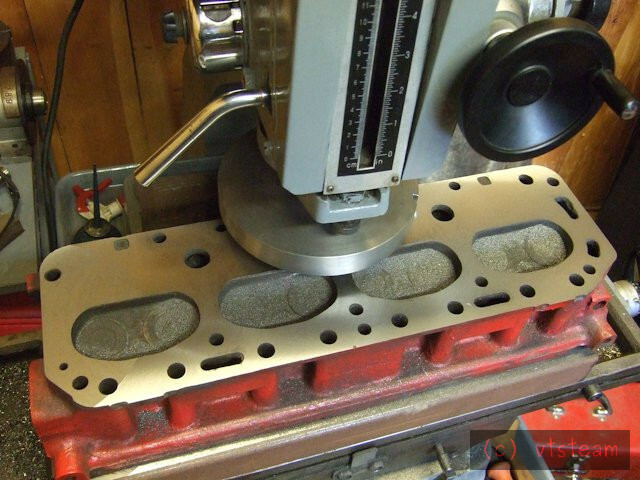 This probably does not apply in your cylinder head project....you tend to plan ahead. Thanks Andrew, good idea. I do have a windscreen wiper motor and speed controller, which I've intended for a couple years to make a motor drive. Maybe this summer. Pekka, that sounds great. And proper! I just wanted to get it done today, and I had purchased some 2" x 3" x 3/16" wall rectangular tube the other day as bearers for the head re-surfacing. So, uhhhhh, I just uhhhhh, super glued those bearers directly to the table using about 8 "dots" (spot welds) all around for each bearer. Let that cure for a half hour. Then I surfaced the tops of those bearers with the new fly cutter, which made them parallel with the table -- and proved out to my satisfaction that the rig would hold against the interrupted cut, etc. Especially with the much heavier cast iron head on top of the bearers. If things were going to break loose, it would happen at the bearer stage when there was little inertia and weight to prevent movement. I presume that you'll warm things up to release the superglue ? And finally (after 5 passes) it were done! Nope Andrew, as they used to say on the Bonomo Turkish Taffy commercials, "Just smack it and crack it!" A few good taps on the side of those bearers released them from both the table and the head. I don't particularly like CA glue for most things, not even model planes, but its brittleness does have an advantage here. If you hit it from the right direction with a sharp blow it's wimpy stuff. But if force is coming from a proper direction (and absorbed by the mass of the head and its inertia) it will hold.